Nestlé’s CEO says he cares what Story of Stuff Community members think. Let’s tell him loud and clear: stop violating public laws to privatize our water! When we announced that we were suing to stop Nestle from taking water in California’s San Bernardino National Forest during the drought, even Time Magazine couldn’t wait to get its hands on the story. Now the US Forest Service’s deadline to respond to our lawsuit is less than two weeks away, and Nestlé is getting nervous. Initially, the CEO of Nestlé Waters North America, Tim Brown, was unfazed by public criticism of his California operations. Last summer, when a journalist asked Brown if he would stop bottling water during California’s record-breaking drought, he replied that he would increase it if he could. But outcry from The Story of Stuff Project’s global community of over one million members has begun to change his tune. Nestlé hoped to schedule a private meeting with our staff. But the truth is that the problems in San Bernardino are part of a larger pattern of Nestlé’s repeated disregard for public laws and resources. To ensure Nestlé receives the message that it’s time to change the way it does business everywhere, we think that Nestlé’s CEO deserves to hear from the public directly. Will you join us in e-mailing Nestlé Waters North American CEO Tim Brown to demand accountability today? 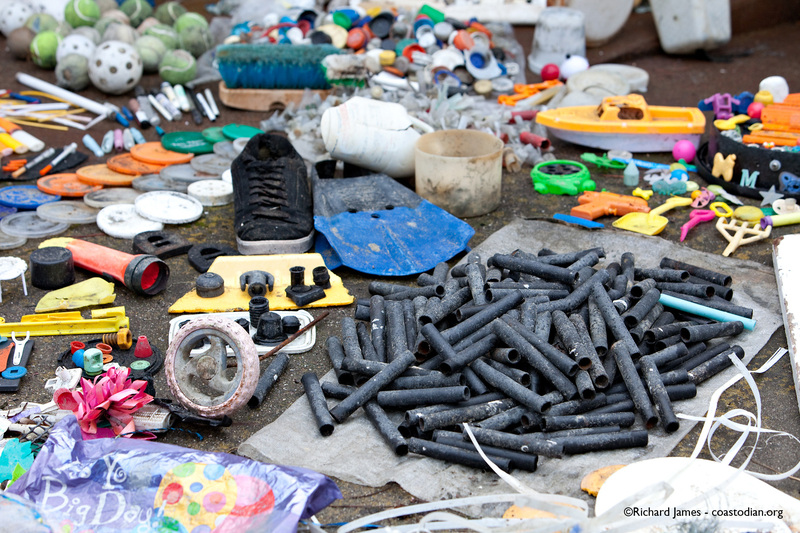 Pay to cleanup the waste generated by polluting plastic products. Stop pushing the cost of cleanup onto taxpayers. The water that Nestlé has taken from the San Bernardino National Forest since its permit expired is estimated at over 1,838,451,342 gallons. This water would cost a regular California citizen millions of dollars. Yet Nestlé has paid the government a fraction of that cost to bottle the public’s resources. 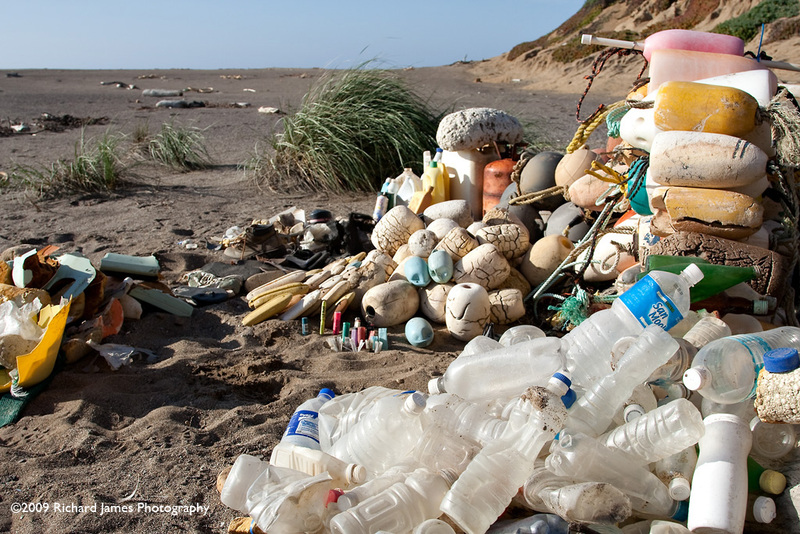 The lawsuit filed by The Story of Stuff Project, Center for Biological Diversity and Courage Campaign has gotten Nestle’s attention in California, but public action is what will result in lasting, global change. Join us now in responding to Nestlé CEO’s request for input, by sending him an e-mail explaining why you think water should be a public resource, NOT a source for private profits. Save our planet – Nestle pays next to nothing to take your water and make millions! Click on the words above “Save our planet – Nestle pays next to nothing to take your water and make millions!” to see this entire post. In this four-minute documentary, experts and activists explain the impact Nestle’s operation is having on the forest and demand that the company and our government ensure this shared public resource is protected for future generations. Nestlé’s permit to transport water through a pipeline across southern California’s San Bernardino National Forest expired in 1988. But the U.S. Forest Service, which is charged with ensuring public land resources are well managed, has bowed to pressure from Nestlé to allow the corporation to continue pumping water. Every year, Nestlé has paid $524 to the Forest Service to operate its pipeline, nowhere near what the water it removes is worth. Nestlé then turns around and sells that water back to Californians and others in plastic bottles, making millions in the process. Nestlé is feeling the pressure from the hundreds of thousands of people around the world who’ve spoken out through petitions and other actions. Now it’s time to up the stakes, and send a message to Nestlé’s corporate headquarters. That’s why we’ve filed suit: to force the Forest Service to stop Nestlé’s illegal operation and undertake a full review of its permit once and for all. This came to me recently and is important enough to share with you all. Please take action and sign this petition. Don’t let a private company take control of the world’s water. Nestlé is locking up local sources of water around the world, pumping them dry to get rich at locals’ expense. Since that quote has gotten widespread attention, Brabeck has backtracked, but his company has not. Nestlé is bullying communities around the world into giving up control of their water. It’s time we took a stand for public water sources. At the World Water Forum in 2000, Nestlé successfully lobbied to stop water from being declared a universal right — declaring open hunting season on our local water resources by the multinational corporations looking to control them. For Nestlé, this means billions of dollars in profits. For us, it means paying up to 2,000 percent more for drinking water because it comes from a plastic bottle. In our story, clean water is a resource that should be available to all. It should be something we look after for the public good, to keep safe for generations, not something we pump out by billions of gallons to fuel short-term private profits. 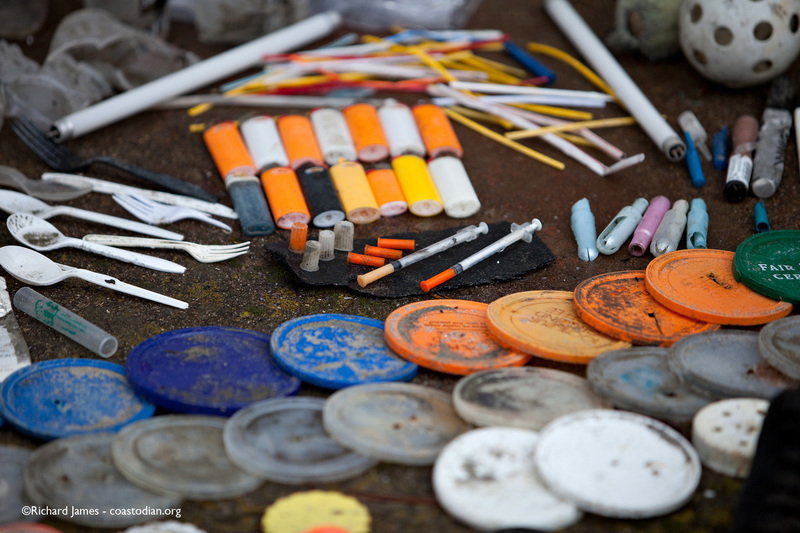 Nestlé thinks our opinion is “extreme”, but we have to make a stand for public resources. Please join us today in telling Nestlé that it’s not “extreme” to treat water like a public right. The debris shown in the images below was collected after the first big storm of 2012 in early February. Over two days I spent 10 hours and covered about three miles of Drakes Beach and South Beach. Just imagine what all the beaches of Point Reyes were covered with from just one storm! The plan was to have posted these images in February. Due to painful distractions, I am finally getting around to sharing what I hope you find are compelling images. That is, I hope they compel you to give some thought to all that happens in order to bring seafood to your table. Tomorrow is the commercial crab opener of 2012. Thousands of crab pots have been dropped in the sea attached to miles and miles of petroleum based rope, foam floats and plastic bait jars. Much of this gear will be lost due to storm, propeller strike or other activities. 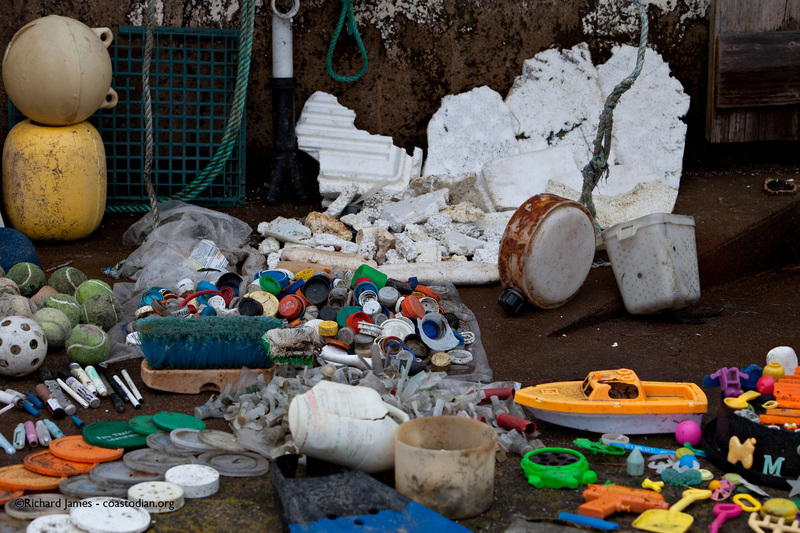 While scraping and grinding along the bottom of the sea, or abrading on the beach sand, many thousands of pounds of plastic will be pulverized and deposited into the food chain. Be sure to have a look at the last picture. There you will get a close look at about 75 oyster spacer tubes from Drakes Bay Oyster Company (DBOC) in the foreground. I have found well over 5000 of these in the last five years. From as far north as the tip of Tomales Point and south to Slide Ranch. Click on image for bigger picture – Maybe some of this is yours? Click on image for bigger picture – If all dogs at the seashore are on leash….how come I find 100’s of tennis balls and ball tossers each year? 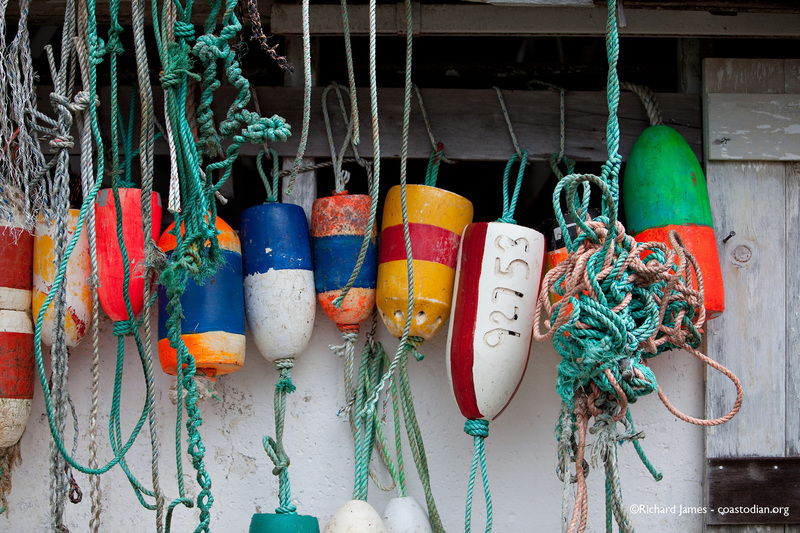 Click on image for bigger picture – Each one of those orange tags represents about $200 in lost gear for a crab fisherman. What if they paid a deposit on each trap set? 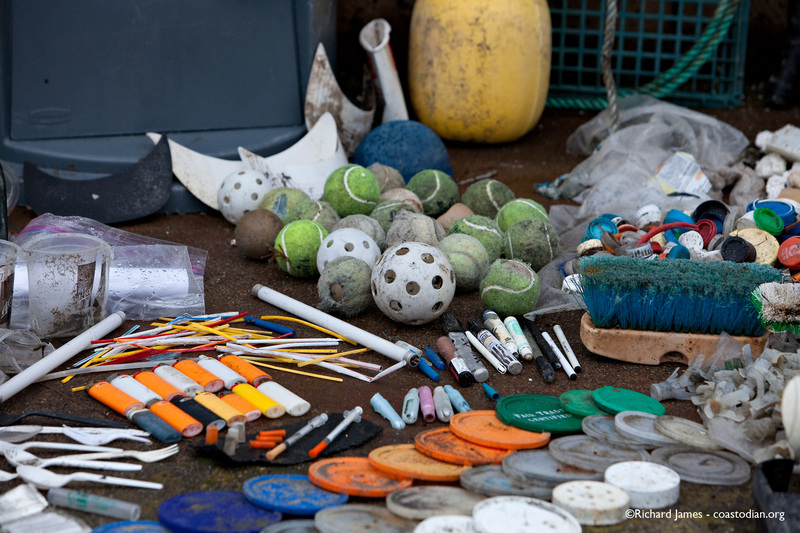 To offset the cost of picking up after all their gear that litters the ocean and beaches. Click on image for bigger picture – Black PVC pipe oyster spacers used by Drakes Bay Oyster Company. You see 75 or so here. I have found over 5000 of these on Point Reyes beaches, as well as dozens oyster grow-out bags and the foam from inside grow-out bags. 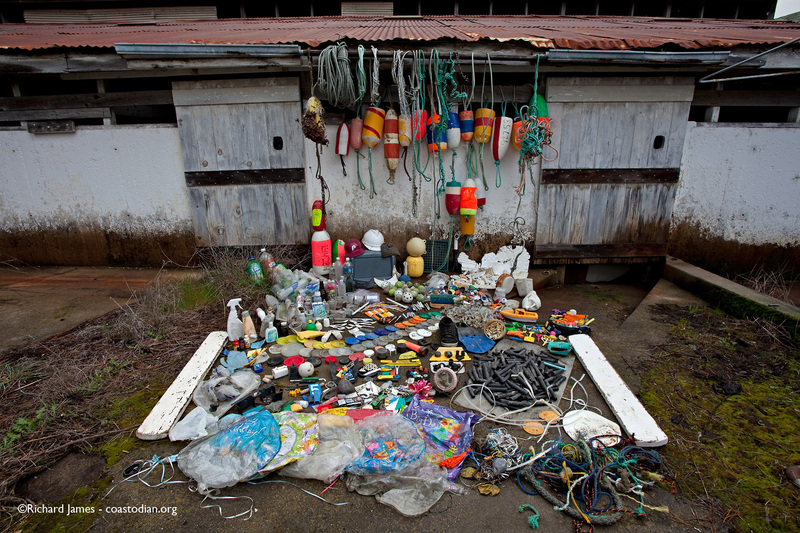 All forms of commercial fishing take a huge toll on our planet. Is it asking too much to set aside portions of the planet as areas we tread upon lightly, or tread upon not at all? Many say we must do all we can to produce food locally, sustainably to feed the 7 billion humans on earth. Others say we need to slow the growth of the human population, keep it more in line with the carrying capacity of earth. This planet is fragile. Humans, only one of the many species on this blue sphere, have developed the means to do great good and great harm. As we ever more quickly modify our nest, it is less able to feed an ever growing population. Does this make sense? Does a growing family move into ever smaller and smaller housing? In 2011 on the 4th of July, the NPS forgot to place a second dumpster at Drakes Beach, something I was later told is the norm. The masses and their hundreds of recyclable beverage containers, BBQ scraps, oyster shells and broken furniture/plastic toys overfilled the lone dumpster. 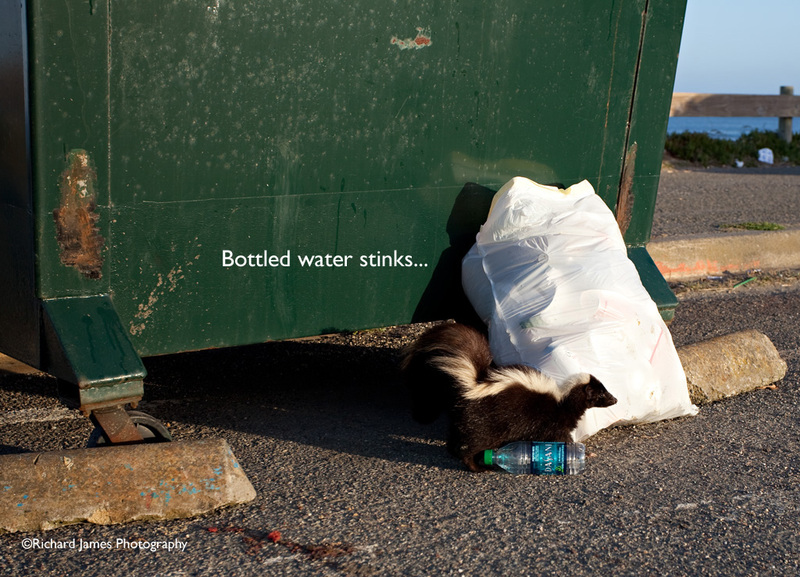 This skunk chewed into the plastic bag you see and scattered debris far and wide. I spent a couple hours picking up after the skunk as well as the wind that had distributed all the items that did not fit into the lone dumpster. Below is a short clip of one of the many visitors to the beach each morning, looking for a bite to eat. Notice this animal does not leave any wrappers or other trash after dining. Last Saturday I walked 3 miles along Point Reyes Beach from North Beach to Abbotts Lagoon with the Point Reyes Plover expert. She does this regularly during Western Snowy Plover breeding season. She also covers other regions of the Point Reyes Snowy Plover breeding area. This day we were on the lookout for 5 Snowy Plover chicks that had hatched recently. 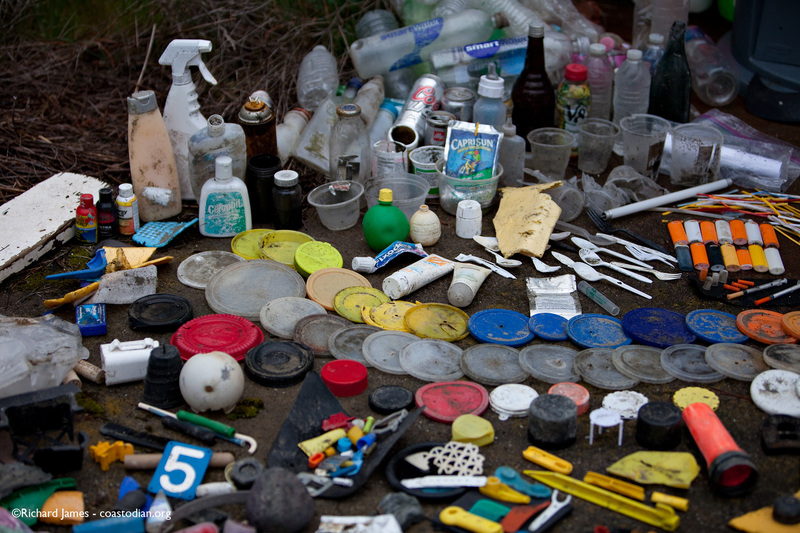 She prowled for birds while I gleaned the plastics that wash ashore on a regular basis. After creating a small depression in the sand and lining it with mostly light colored rocks to increase the stealthiness of the nest, a female plover will lay 2-4 eggs directly on the sand. Most times she lays 3 eggs. About 28 days later, if the sea has not washed away the eggs, ravens, crows, coyotes, raccoons, skunks or weasels have not eaten the eggs, off-leash dogs or errant humans have not trampled the nest, the birds emerge form their cocoon. Plover chicks are “precocious”, meaning that they are out of the nest and cruising for food within hours after hatching. Mother plover leaves to go find another mate, father plover begins a month-long odyssey attempting to ensure his brood learns to eat, and keeps from being eaten. Researchers consider a chick fledged if it survives 28 days. The last 3 years at Point Reyes have seen 7, 8 and 5 chicks fledge (2010, 2009, 2008). There are an estimated 5000 plovers, period. Western Snowy Plovers are on the endangered species list. This means that they are in danger of going extinct. Extinct means there are no more plovers. Ever. Dog owners, please keep this in mind the next time you want to let your domesticated, far from extinct pal run off-leash in this area. Beach driftwood architects, enjoy building your complex driftwood structures. But, once you are done, please dismantle your work-of-art. Ravens use these structures to rest and look for prey, including endangered plovers. Don’t make it easy for ravens to further reduce the dwindling numbers of snowy plovers. 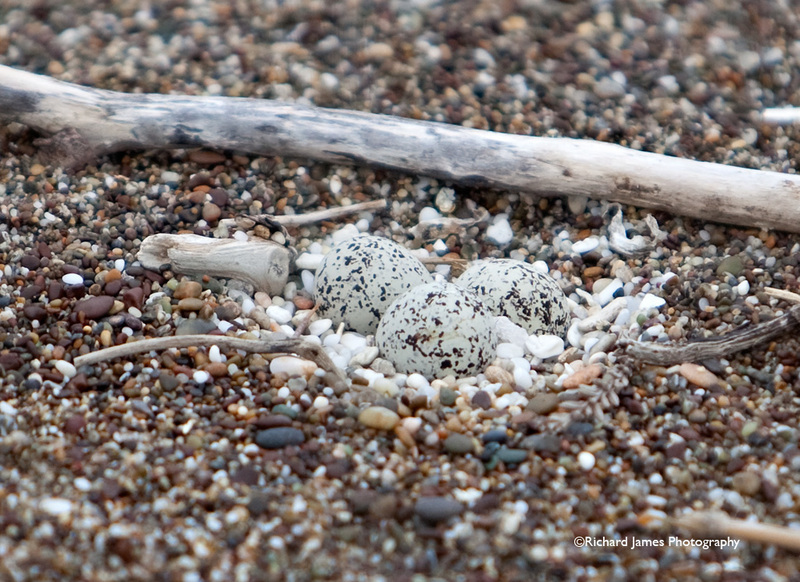 The park plover expert knows when each plover egg is laid and when each chick hatches. Finding all plovers present and accounted for each day is a good day. Last Saturday we found all 5 chicks, plus fourteen adults for a total of nineteen birds. 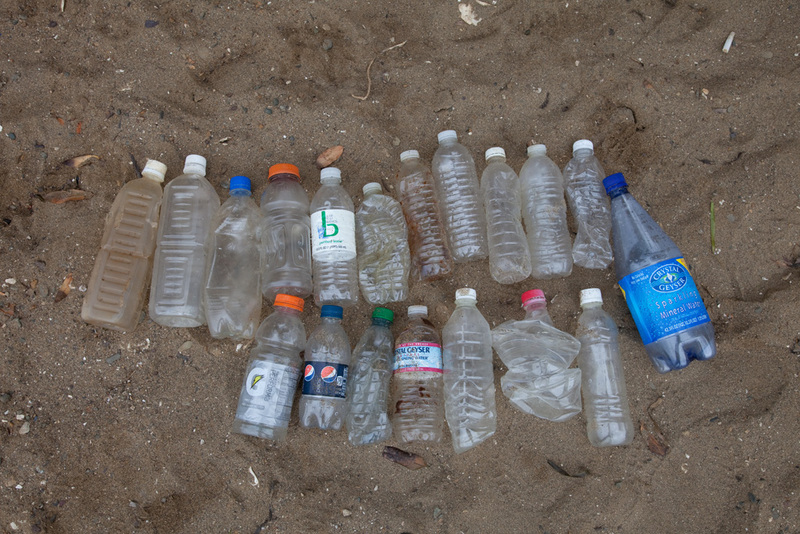 I found a small bag of plastic trash, including nineteen plastic beverage bottles. So, depending on one’s perspective, nineteen is too small, and too large. Please use one metal bottle for your drinking water needs. 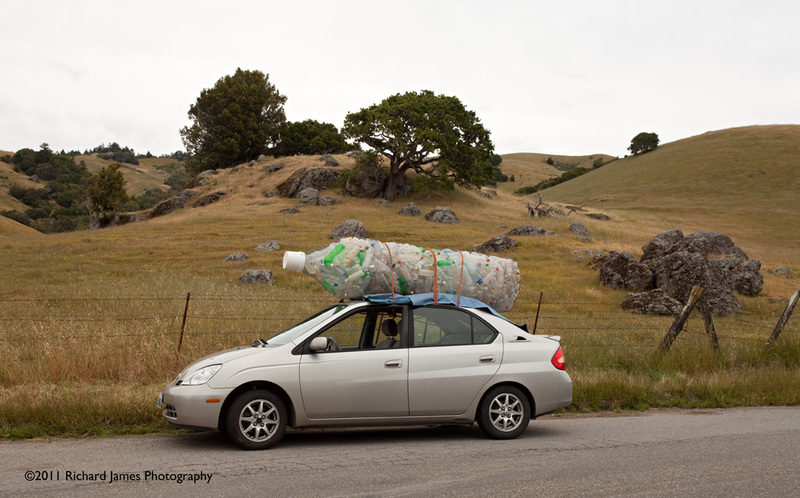 Does my Prius consume more gasoline to go a mile than was needed to build and ship all those plastic bottles on the roof? Google could give me lots of numbers in a short time. My eyes tell me that plastic bottles, even one, consume too much oil. We kid ourselves, thinking it gets recycled, all is good. 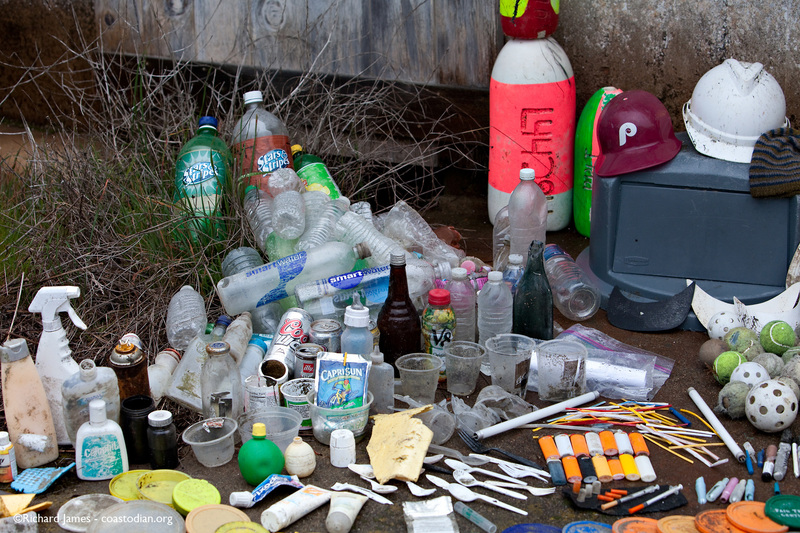 If it gets recycled, why do I find thousands upon thousands of plastic water bottles on a fraction of the California coast each year? What about all the animals that will eventually eat all that plastic we keep dumping in the ocean? Man is one of those animals. Tomorrow, instead of pouring milk on your cereal or in your coffee, eat the bottle. Cut out the middleman and save. Experience what all the fishes and birds in the sea do every day. Or buy milk in a glass bottle. Or raise chickens and trade their eggs for milk from your neighbor’s cow Rosie like a friend of mine does. That bottle on my car is at Marin Arts Council for another month as part of their Pop Art show. Go see lots of cool art. Buy a card and support the arts and your local coastodian. Get a metal water bottle and use your tap. Put a filter on the tap if you don’t like the taste. 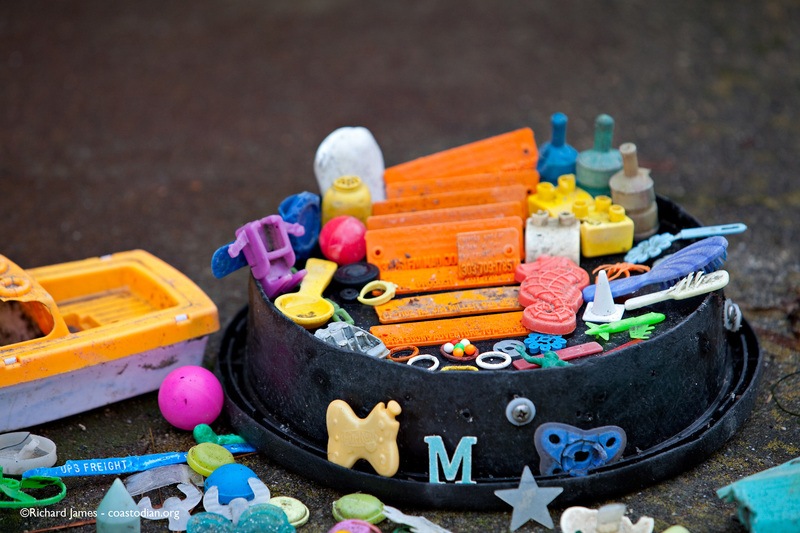 Stop fouling the rivers if you don’t want to filter that which belongs to our children, and their children, and so on. Of the thousands of plastic water bottles I picked up and packed out during 2010, only one of them was an empty, sand encrusted SmartWater bottle. So far during 2011 I have found three. A twelve-hundred percent increase over last year. With so much smart drinking going on, people will soon realize they have been doing it all wrong with respect to drinking water. Water, the old-fashioned stuff that flows down rivers once flush with wild salmon is composed of two hydrogen molecules and one oxygen molecule. Ideally not much else. SmartWater is so much more. SmartWater is distilled tap water, with electrolytes (likely salt) added. Nothing more. Enhanced water in the parlance of the marketing gurus that peddle it. Much energy has been expended to school this dullard. After so costly an education, this water is too good to run from a simple tap. A petroleum-based plastic bottle is produced to contain this erudite brew. Only now can you, the thirsty consumer be expected to pay more than ten dollars per gallon for it. If this water is so smart, then I should never find a single misplaced bottle on the beach. All of them should be getting recycled, right? Unwilling to afford this crazy, Coca-Cola owned concoction, I wonder if I can home school my tap?